Under an "adult-sized" mobile displaying a curious mix of glass orbs and brass ornaments, while a disco ball and wall of light panels sat dormant in anticipation, out ran Leslie Feist onto the Massey Hall stage last night (September 24) in a striking magenta dress — the colour that truly defines her latest album — to take a series of delightful little bows. "We want to share Pleasure with you tonight: beginning, middle, end," she said, moments after that plan was set into motion with opener "Pleasure." From the first strum of her guitar, the audience must have known they were in for an enjoyable eve. As the drums joined in, the lights blossomed with the beat until a spotlight set upon her, adding emphasis and meaning to the line as she sang, "It's my pleasure, and your pleasure, that's the same, it's what we're here for!" As the repeated lines of the chorus rang out, the lights turned the band and stage magenta, blushing like a cheek warmed with love. And so it went, as Feist and her three-piece band made their way through the track list of Pleasure, song by song. "Lost Dreams" saw the slow unfolding of the large floral light-up fan at centrestage. "The Wind" was dedicated to the Canadian Shield, while "Century" was for her father: "My papa isn't doing too well, so we're doing a futuristic live feed to his hospital room," she said with a soft wave before having the entire crowd yell, "Hi, dad!" "A Man Is Not His Song" found Feist's vocals dancing along in harmony with a violin, while the magenta light grew a deep red as she worked with a loop pedal during the ending of "Baby Be Simple." Her voice was incredible, her energy bubbly and infectious. It was, as a whole, absolute magic. The night housed too many sweet moments to count, really. For every ounce of talent that radiated from her, Feist matched it with cheekiness in her actions, dancing and bantering away between songs. "Let's take it to the next level and look at the person you want to leave with," she said during "Any Party"; "Come on, it's summer again. There's a power of looking someone in the eye." Then, later: "Put your hand in the air if you've turned 40, 'cause I know that you know that I know that you know what I'm talking about." She invited a couple to dance onstage during "Young Up," saying, "Slow dancing has kind of been lost, how about you two come on stage? I see the love in your eyes." After encouraging dancing in the crowd as well, and pointing out a couple of friends, she sweetly added, "Okay people, let's stay young!" Once the run-through of Pleasure was finished, Feist took a jaunt through older moments. A deconstructed and powerful take on "My Moon, My Man" had large shadows of the band cast behind them, and the band sounded just as big as they appeared in silhouette. "A Commotion" brought tension under blue light, while "Sea Lion Woman" saw a frenzied Feist shush the band before raising them back up again (after an amusing failed clap-along attempt in the crowd). "I Feel It All" had bodies moving, and "Let It Die" encouraged three more couples to slow-dance on stage, including two complete strangers that Feist brought together, while the disco ball finally sprang to action. 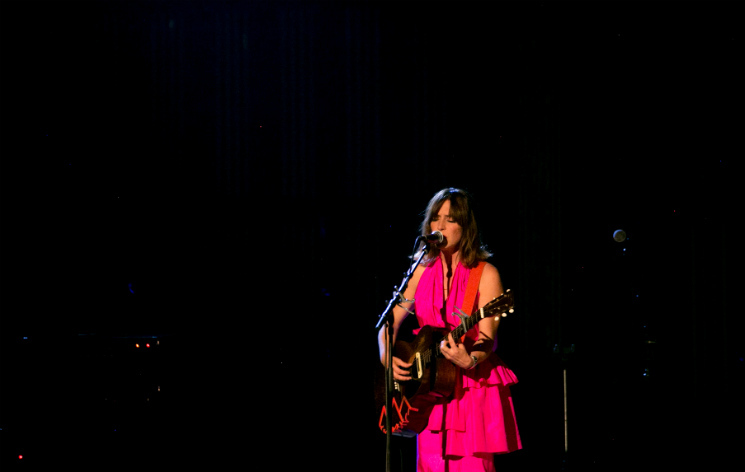 "Mushaboom" was delivered in a solo, acoustic fashion, and "1, 2, 3, 4" was personified into a woman that stumbled back into Feist's life after much time away. As Feist stepped away from the microphone singing, "Did I, did I, did I?" from The Reminder's "Intuition," the large floral fan slowly shutting, drawing the eve to a close, we could all agree: yes, we did. We felt it all.